There was an elephant in the room at McLaren on Thursday - the absence of the team's technical director Paddy Lowe from the launch of the car whose design he had overseen. By rights, Lowe should have been present to receive the admiring glances of the world's media and other guests as they were given their first look at a car that everyone expects will be one of the pace-setters in Formula 1 this season. Instead, he was somewhere else - whereabouts and future unknown - on a day's holiday following the revelation by BBC Sport last week that Mercedes have offered him a job running their Formula 1 team. Team boss Martin Whitmarsh made it clear that Lowe would continue to work for McLaren for the rest of the year. Managing director Jonathan Neale added that Lowe was still the team's technical director. But for how long he remains in that role rather depends on what happens with Mercedes. If Lowe signs up with them, he will likely be shunted off the McLaren F1 programme to work somewhere else in the organisation. If he turns their offer down, Neale said there was no reason why he could not continue in his current role. For McLaren, it was an unwelcome distraction from the event that traditionally launches their season - at least in the eyes of the public. Behind the scenes, of course, efforts have been focused on 2013 for some time now. The result is a car that looks like a significant step forward from one that was already the fastest in the field at the end of last season. McLaren say they considered simply evolving the 2012 car but realised that, in the words of engineering director Tim Goss, they "needed to make a bigger step". The result, Goss said, was that "we have reworked the car from front to back". That was apparent in the higher nose, revised sidepod intakes and remarkably tight rear - so tight that there is now a gap between the bottom of the rear bodywork and the top of the floor, the aim to enhance the amount of downforce in a critical area of the car. 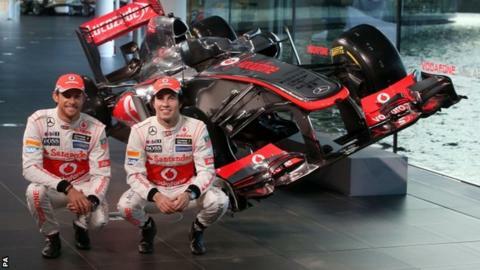 "McLaren finished last year with the fastest car and the new MP4-28 looks like a good improvement on that. "The steps forward start at the front with a higher nose and chassis, pretty close to the maximum allowed height, which gives more room for better airflow under the car than last year. "They have followed Ferrari's 2012 lead in using pull-rod front suspension, which has a lower centre of gravity and the pull-rod manages the airflow off the front wing better than the more common push-rod. "The sidepods have been moved backwards, giving better airflow, and the back has been focused on maximising that flow. "The driveshaft and lower wishbone have been packaged in one element and the rear bodywork is heavily scooped out to make the most of the downforce-producing 'coke-bottle' area between the rear wheels. "The idea is to separate that airflow from the exhaust gases, which McLaren have continued to treat in the way they did last year, rather than using Red Bull-style tunnels. "McLaren are one of the few teams to have small-diameter exhaust exits, which gives faster airflow and therefore more downforce when they hit the aerodynamically shaped rear brake ducts. "Overall, McLaren look to have made a good step forward." McLaren will find out exactly how it works when pre-season testing begins in Spain next week, but Jenson Button said the first signs were already encouraging, having 'driven' the car in the team's simulator. "The car in the simulator feels very good," the 2009 world champion said. "In terms of pace, it's not something we look at. It's the feeling you get from the car. I have a better feeling from this car, as soon as I jumped in it, compared to 2012." Talk of 2012 was a reminder of the other man who might have been at the team's base on Thursday but was not - Lewis Hamilton. Button's team-mate for the last three years has jumped ship to rivals Mercedes (yes, them again) and it remains to be seen how well new signing Sergio Perez will fare and whether McLaren will miss Hamilton's electrifying pace. At the launch, Whitmarsh neatly sidestepped the issue of Hamilton's departure by insisting he was "looking forward". But people both inside and outside McLaren are wondering whether the team will come to rue the absence of what one staff member has described as "Hamilton's 0.4 seconds". Quicker per lap, that is, in terms of outright qualifying pace. The stats, though, show that while Hamilton may have had the edge on Button in terms of outright single-lap pace, Button actually outscored his team-mate in their three years together, including 2011, when Hamilton suffered his "annus horribilis", coming close to personal meltdown. Without Hamilton's occasional high-maintenance behaviour, McLaren may well be a more serene environment this year, depending on how well Perez adapts to the demands placed on him. Three podiums for Sauber last year was a cause for celebration. In 2013, the 23-year-old Mexican will be expected to be at the front week-in, week-out. But whether McLaren miss Hamilton on the track rather depends on whether Button can find the consistency across the season that has often deserted him in the past. It is well known that when the car is not behaving as he likes, Button can struggle more than top-line rivals such as Hamilton, Fernando Alonso and Sebastian Vettel. Button acknowledges this but believes that developments to the car - and changes to the Pirelli tyres for this season - will help him. "Qualifying at times last year was not good at all," he said. "I still go back to it being an issue with the tyres and getting them working. I don't know why that is. "We've learnt a lot from last season and the problems I've had personally. It wasn't just me and I feel we've made steps forward in that direction. "We have a tyre that helps me. It has a much wider working range. We start this season from a clean slate and hopefully we'll be fighting for a win and pole position and every race." In fact, Pirelli's changes could have played into McLaren's hands. They have made the tyres softer again, in an attempt to ensure at least two pits stops a race, and that could favour drivers who have proved to be good at managing and taking care of tyres - drivers like Button and Perez, for example. If the new McLaren is as good as it looks, the team have solved the reliability problems that torpedoed Hamilton's campaign last season and Button can find that consistency he craves, then the Briton could claim a second drivers' title - and give McLaren only their second since 1999. But that is a lot of ifs. For McLaren and Button, Thursday was the time for hope. Reality - and the answers to some of those questions - begins next week.